Much like Laguna Beach, Menton, France, is a picturesque beach town tucked away along the French Rivera. With its rolling hills sloping down towards a captivating coastline and its streets lined with shops, restaurants and art museums, it is an ideal sister city for Laguna Beach. Corazones Alegres folkloric group dances on the Main Beach boardwalk. After establishing the Laguna Beach Sister Cities Association in 2008, founding member Karyn Philippsen visited the town nicknamed “the pearl of France” and knew they had found a near perfect twinfor Laguna. 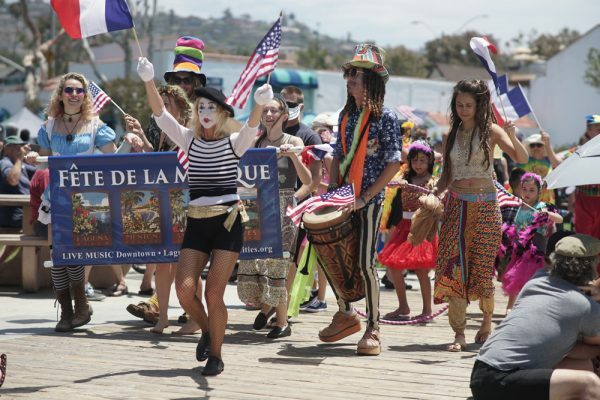 This Saturday, June 16, Laguna mimics a Menton tradition, the annual Fête de la Musique, where musicians perform free in multiple locations around town: downtown, in Laguna Canyon and in the HIP District between Thalia Street and Bluebird Canyon Drive. Laguna celebrate its 11th annual Fête with musicians playing free in 48 locations, on street corners, inside stores and under storefront eaves. “It’s a celebration of music from all over the world. It can be anyone from a retired military person to a little girl singing opera in the alleyway trying to hear her voice echo,” Philippsen said. The festival started in Menton and now is held in almost 700 cities in 200 countries all over the world. “It just really pulls on your heart strings, it goes full circle in such a unique way,” Philippsen said. Festivities begin on the Main Beach cobblestones at noon with a children’s parade and performances by the Swing Set band. 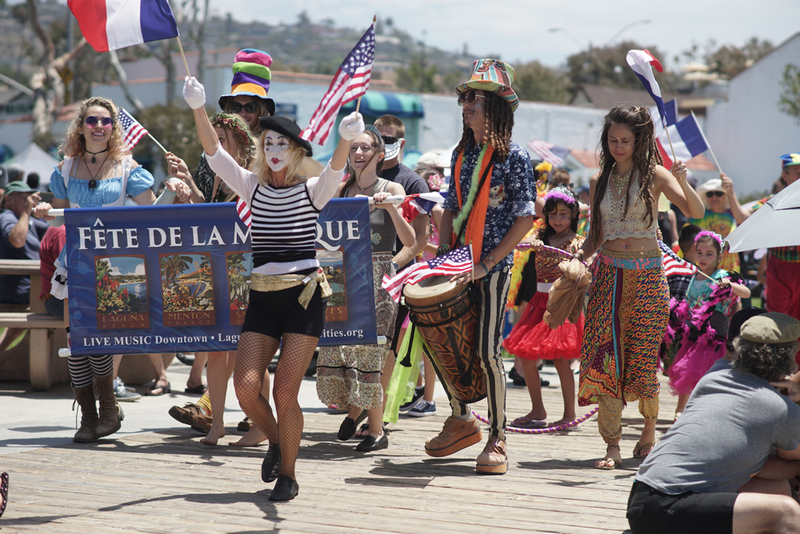 After introductions from city representatives, music will begin to reverberate through Laguna’s streets at 1:30 p.m.
Children parade through Laguna with Fête de la Musique performers. Photos courtesy of Sister Cities Assoc. Ken Aubuchon, the festival performance organizer of six years, said there will be a wide range of performances from jazz to Hawaiian to Mexican folkloric dancers. Many artists return yearly and are excited to share their talents with the community. Among the returning artists and a former performance organizer is Chic McDaniel, leader of the Hawkins group, which has performed intermittently in the movie theater alcove since 2008. McDaniel was invited to perform as well as assist with the festival by Carol Reynolds, another Sister Cities member. “It gives us the opportunity to hone in on songs and really get them polished up and get them presented to an audience,” McDaniel said. His group will be playing a total of 43 songs from the ’50s to the ’70s between 1 and 4 p.m.
“The Fête is different from the standpoint that it encourages and attracts people that are not professional. They are simply enjoying playing music,” he said. Some of these non-professionals are discovered at voice contests held in Laguna. Opera singer Rick Weber was asked to perform last year after impressing Aubuchonat one of these competitions. He will be returning for his second year and will perform inside the clothing store Casual Laguna. The storeowner is an opera fan, creating a perfect pairing. “You’re not used to hearing a guy like him standing up and singing opera. He just blows the place away,” Aubuchonsaid. A change last year, the addition of performers in the HIP district, will continue and broaden to include performances in the canyon as well, what Philisppen described as “a little triangle of entertainment.” A stage will also be added for performances on Main Beach. Red, blue and white balloons will indicate where each performer is located. Laguna has established similar sister city relationships with San Jose del Cabo, Mexico and St. Ives, England as well as Menton. 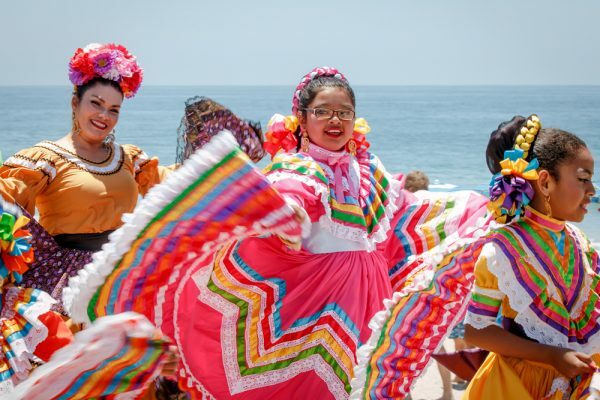 On every Father’s Day weekend since its introduction to Laguna Beach, the Fête de la Musique reminds Laguna’s residents and visitors of its sibling in Europe. For a full list of performers visit lagunabeachsistercities.com. Eco-Hypocrisy runs rampant in Laguna Beach every single day. Self-styled priests of Climate Change Sharia preach daily on the evils of fossil fuel and the oil companies that produce them. Then they get into their luxury cars and drive to streets ringing music, Hate Trump protests, Pageant of the Masters, Sawdust Festival, museums, restaurants, *eco-tours* (sic), and an unlimited list of other venues around the city, around the state, and around the world. Congratulations on another great Fete (11th) – we marveled at the wide variety of people of all ages and ethnicities – the goodwill the City spreads during this event is incalculable! But the City should do a little by giving those musicians who play for free a one-day parking pass upon request. Wow — you got up on the wrong side of the world today.